Mezoneuron glabrum "sensu Fern.-Vill., non Desf." Liana or small tree, up to 20 m; branchlets unarmed or with a few prickles. Stipules triangular, c. 2 mm long. 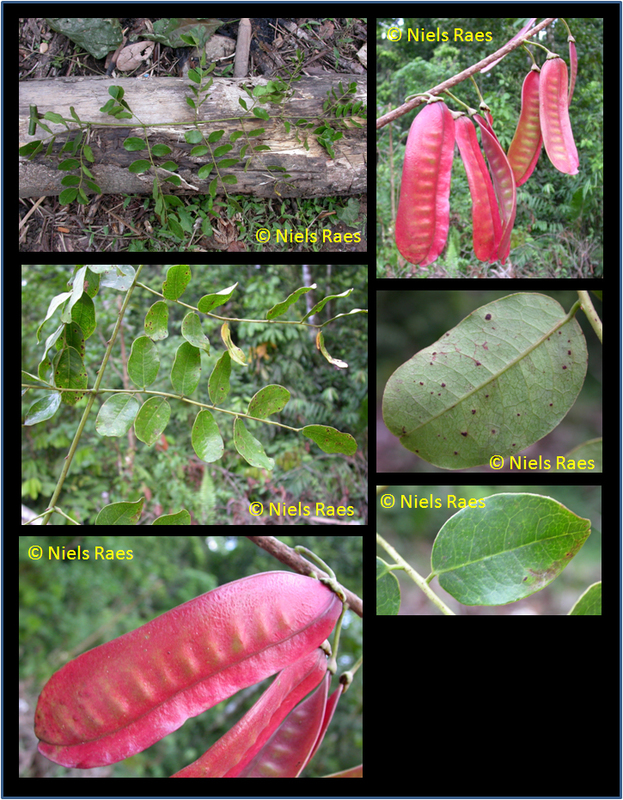 Leaves: rachis 20-40 cm; pinnae 4-8 pairs, 7-13 cm. Leaflets alternate to subopposite, sometimes some of them opposite, 6-8 pairs per pinna, petiolulate (1-4 mm), membranous to coriaceous, oblong or obovate, 1.5-7 by 0.75-5 cm; base unequal to subequal. truncate, obtuse, or cuneate; apex rounded, truncate, or retuse; glabrous or appressed shortly hairy. Inflorescences axillary and terminal, paniculate, 30-100 cm long, the rachis unarmed; pedicels 10-20 mm. articulated at the base. Flowers pubescent or glabrous. Hypanthium 3-5 mm deep and 7-12 mm wide. Sepals: lowest one twice as long as the others. 7-15 by 6-8 mm. Petals: standard arched, bilobed to about half of its length, 8-12 (-19) by 6-l0 (-14) mm, 1-2 mm wide at the base; the other petals 2-6 by 1.5-3 mm, shortly clawed or sessile, often ciliate. Stamens far exserted; filaments c. 14 (-22) mm; anthers 1-2 mm. Pistil pubescent or glabrous; ovary c. 5 by 1 mm, flat, 6-13-ovulcd; style c. 8 mm, stigma oblique, hairy along the margin. Pods (pedicels 15-31 mm) 10-16 by 3-5 cm (incl. 10-15 mm wide wing at the upper side), indehiscent; base cuneate; apex variable, 6-9 (-13)-seeded. Seeds ellipsoid, 9-12 by 6-7 mm, flat, brown, dull" [From Flora Malesiana I, 12, 2: 547:548). Rocks on sunny hot dry slopes, riverbanks and roadsides, primary forest and forest fringes, from 100 to 1500 m altitude. In the Philippines, young shoots eaten as salad. Decoction of leaves given to relieve asthma. From Vietnam and the Philippines to Malaysia, Indonesia and New Guinea.